It’s taken a while – almost four years in fact – but the owners of former Cunard flagship Queen Elizabeth 2 announced today they have finally settled on plans to convert the vessel into a 300-room luxury hotel. The ship will be the centrepiece of the cruise terminal at Dubai’s Port Rashid, and the development will include the construction of a maritime museum. QE2 devotees will be delighted to learn that elaborate plans to built penthouse apartments in the ship’s funnel have been abandoned. Sultan Ahmed Bin Sulayem, chairman of owners Istithmar World, has acknowledged that visitors will want to see the ship as it originally looked, so there are now no proposals to change its appearance. The ship’s fate has been at the centre of fevered speculation since Dubai bought it for $100 million in 2007. The original plans, which included a purpose-built berth at Palm Jumeirah, were abandoned when Dubai’s economy fell into crisis. The vessel has since languished at a desolate and dusty quayside (above) while new options were being considered. Conversion work on the ship and construction of the museum are expected to be completed within 18 months. Many of the artefacts and art works collected during the ship’s 40 years of service will be put back on show, although some of the finest – including a solid silver scale model of the vessel (above) – were reclaimed by Cunard to be displayed on board Queen Elizabeth. Sultan Bin Sulayem said today: “The QE2 will be at the heart of Dubai in its permanent position at Port Rashid and contribute to the growth of Dubai as the city continues to develop and expand as a top tourist destination. Project director Leili Gerami added: “Even in its retirement the QE2’s majestic profile continues to attract much attention and there is considerable interest and enthusiasm for the next phase of her long life. “It is our desire to tap into the continued public fascination for the great passenger liner and its amazing history as a cruise ship with unrivalled luxury, style and prestige. We believe the hotel on board the QE2 will be one of the finest anywhere,” she said. Dubai welcomed 108 cruise ships and a total of almost 400,000 passengers in 2011, and the numbers increased by about a third in the first half of this year. 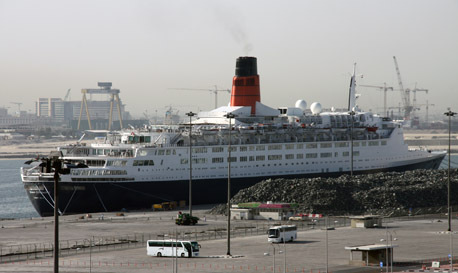 Dubai Tourism expects 145 ships and 500,000 passengers by 2015.